The third entry in the Murder New York Style mystery series is available now at your favorite retailers in e-book and paperback. Among twenty great stories is included the Short Mystery Fiction Society’s Derringer Award-winner for Best Short Story of 2014 “The Kaluki Kings of Queens” by Cathi Stoler! 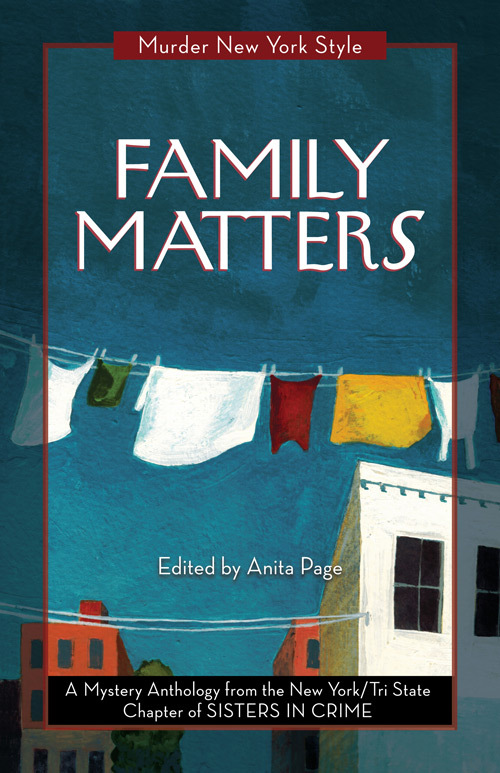 Family Matters: Murder New York Style, an anthology by the New York / Tri-State Chapter of SISTERS IN CRIME, edited by Anita Page. Click here to find it at: Amazon, Barnes & Noble, iTunes, Kobo, Google Books (on Google Play), and Books a Million! Come meet the relatives in twenty short stories by members of the New York / Tri-State chapter of Sisters in Crime! These tales are as diverse in theme and mood as the city itself, taking you from the explosive excitement of the New York City Marathon to a secret cellar in Queens; from the warmth of an immigrant culture to the moneyed New York art world; from brutality and poverty to Wall Street’s privileged thugs. What all the families have in common is this: their lives have been changed forever by crime. Motives? The usual: jealousy and greed, rage and revenge, self-protection and politics, secrets and lies. No Metrocard or E-ZPass required to tour these neighborhoods! SHE’S yelling at me. Not for the first time today and not even for the twentieth. “IF you see me again, give me a shout out,” Michael said, knowing full well it was nearly impossible to spot a friend, much less a stranger during the New York City Marathon. YOU know: fish salad, lasagna, sausage, meatballs, beef and pork braciole, pork skins, roast loin of pork, fried cipolle, mushrooms, candied sweet potatoes, string beans, and stuffed artichokes. IT was when Pop asked for the next beer that the trouble started. THE bag’s pattern, Cheerful Sunrise, was just that and it would be easy to keep in sight when it went through the security X-ray at JFK. BACK in the day, they played the game all over the borough, from Jackson Heights to Forest Hills to Rockaway, at any synagogue or Knights of Columbus hall that had a couple of decks of cards. BUT it’s true that in New York City, if you walk out the door and spit, you might hit six therapists. SURROUNDING the upper level was a narrow balustrade, sometimes called a widow’s walk, where the seaman of yesterday and his family could watch for ships arriving and sailing, and see the warnings of the lighthouse at Norton’s Point. A STREAM of blood ran down his cheek into the sink, cold water tinted pink splashing my apron. I COULDN’T see or speak, but I could hear footsteps creeping toward my hospital bed. MOTHER would call me after an especially grueling day of enduring his begging, cursing, sobbing apologies, cursing, and begging some more to ask me what to do. SHE touched her hair where it turned under, stiff with hairspray, and remembered those first days in this country, when even the air around her seemed to have substance–impeding her, like water, the honking horns, the thick whiffs of car exhaust, the heat shimmering knee-high above the asphalt. MILLIE reached down, opened her bottom desk drawer, pushed aside the Glock and pulled out the tissue box, offering it to her newest client–this mess of a female who had just confessed that she suspected her husband of cheating. FROM my makeshift batter’s box, I could see the tower above NY-54, the closest missile battery protecting us from the Commies. TODAY though, there were only the greenish ghosts of bruises past. I DON’T push, mind you, and I’m no parish priest, but Sadie’s street-wise confessional is open 24/7. SHE didn’t care about the future, only the present here with Tim, memorizing his deep set blue eyes and perfect nose. WHEN we were young, Sylvia and I used to spin the battered globe on the desk in my living room and jab our fingers at the flying green lines, trying to touch the little village with the unpronounceable name they had come from. Find Family Matters at: Amazon, Barnes & Noble, iTunes, and Kobo , also Google Books (on Google Play) and Books a Million! Because every family in New York has its share of dirty laundry! Pingback: Cathi Stoler Wins 2014 Derringer Award for Best Short Story!